Franco Albini’s works of architecture and design, produced between 1930 and 1977, have enjoyed a recent revival but to date have received only sporadic scholarly attention from historians and critics of the Modern Movement. A chorus of Italian voices has sung his praises, none more eloquently than his protégé, Renzo Piano. Kay Bea Jones’ illuminating study of selected works by Studio Albini will reintroduce his contributions to one of the most productive periods in Italian design. Albini emerged from the ideology of Rationalism to produce some of Italy’s most coherent and poetic examples of modern design. He collaborated for over 25 years with Franca Helg and at a time when professional male-female partnerships were virtually unknown. His museums and installation motifs changed the way Italians displayed historic artifacts. He composed novel suspension structures for dwellings, shops, galleries and his signature INA pavilions where levity and gravity became symbolic devices for connoting his subjects. Albini clarified the vital role of tradition in modern architecture as he experimented with domestic space. His cohort defied CIAM ideologies to re-socialize postwar housing and speculate on ways of reviving Italian cities. He explored new fabrication technologies, from the scale of furniture to wide-span steel structures, yet he never abandoned the rigors of craft and detail in favor of mass-production. 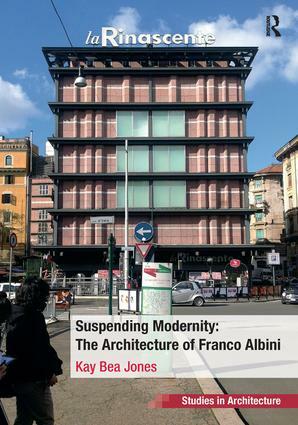 Suspending Modernity follows the evolution of Albini’s most important buildings and projects, even as they reveal his apprehensive attitudes about the modern condition. Jones argues here that Albini’s masterful use of materials and architectural expression mark an epic paradigm shift in the modern period. Kay Bea Jones is an Associate Professor of Architecture at the Ohio State University, USA.